Fleep is an alternative to Slack. So, if you’re using Fleep and your partners are using Slack, you can use this webhook integration to connect any Slack channel with any Fleep conversation. Once set up, the Slack integration will send all messages* posted to the Slack channel to the connected Fleep conversation and vice versa. Follow the following steps to set up your Slack integration. When you have completed Steps 2-8, all messages posted to the Fleep conversation will also show up in the Slack channel you have connected. Steps 9-12 ensure that when messages are posted to the Slack channel, they will also be sent to the conversation in Fleep. 2. 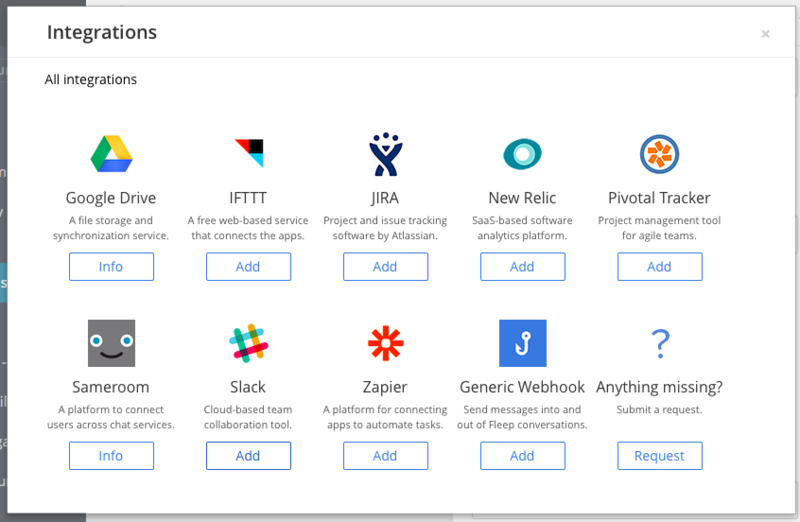 Open the Slack App Directory, and find Incoming WebHooks. On the Incoming Webhooks page, click on the Add Configuration button. 3. 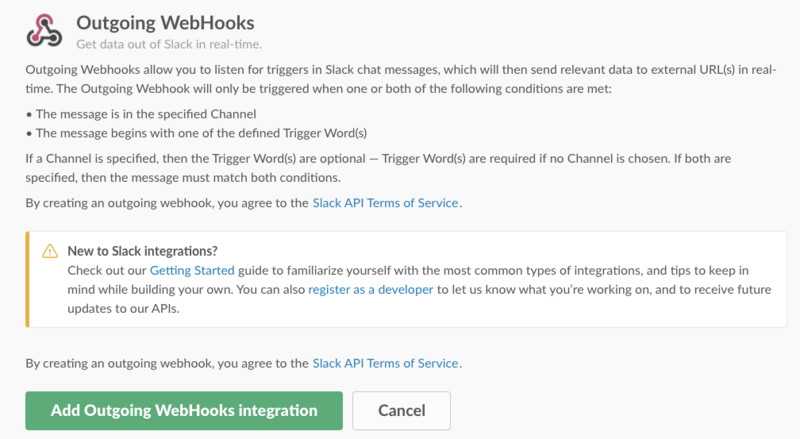 Now, choose the channel or conversation you want to integrate and click on Add Incoming WebHooks Integration. 4. In the next view, you can customize the integration as you wish (don’t forget to Save if you do make any changes). 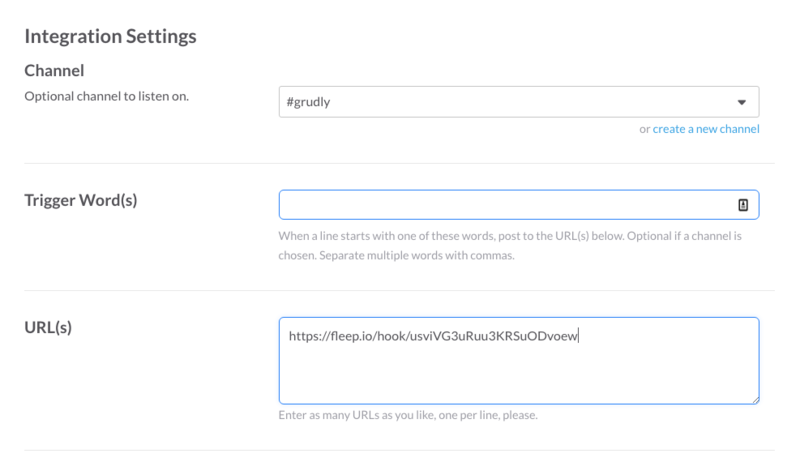 Also, find the Webhook URL – copy this, as you will need it in the next step. Then click on Create to generate a hook for the Slack integration. Now you have successfully set up the first part of the integration – messages posted into that Fleep conversation will also show up in the connected Slack channel! 8. Open the Slack App Directory, and fing Outgoing WebHooks. On the Outgoing WebHooks page, click on the Add Configuration button. 11. Now, click on Add Outgoing WebHooks integration. * Any files posted into the connected Slack conversation will not be sent to the respective Fleep conversations, and neither will any of the associated comments attached to the file. ** All files posted into the connected conversation in Fleep will be sent as links to the Slack conversation – and are only accessible if the person has a Fleep account that has been added to the Fleep conversation.